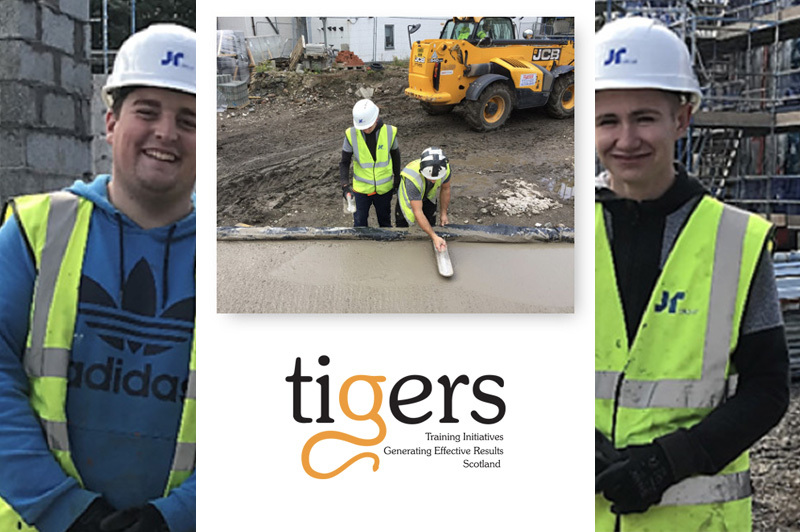 Upon identifying the need for additional labour at Olympia Street, Glasgow, our Community Benefits team contacted TIGERS a training provider and employment broker. TIGERS specialise in training and preparing young people for entry into the construction industry. TIGERS operate by offering work placements for 6-8 weeks, fully funded through skills development Scotland. Potential candidates work on a live site Monday to Thursday where they gain real life experience on site and return to TIGERS training campus on a Friday to gain additional accreditations. At the JR Group we have always demonstrated a commitment to Investment in young People and we were impressed by the business like approach of TIGERS. As a business, the opportunity to fill the vacancies while creating work placements and potentially full time employment for unemployed young people seemed perfect. On 2nd June 2018, our Community Benefits Co-ordinator met with Derek Johnstone (TIGERS Employer Engagement Officer) to discuss recruitment and training requirements, specifically for Olympia Street. TIGERS identified 6 potential candidates who suited the labourer positions. After reading through all 6 CV’s we shortlisted Gregor McGlachan and Reece Brown. Following the collapse of Carillion, both boys had been made unemployed more than halfway through their GCO Level 2 qualification which they had been working towards. On 20th July 2018, we decided to take both boys on at our Olympia Street, Glasgow. On the 24th July 2018 we arranged for the 2 boys to take part in the concrete pour of Block 2, 3 and 4. Allowing Gregor and Reece to successfully complete both their TIGERS pre apprenticeship programme as well as their SQV in Construction and Civil Engineering Operations in Construction. – Following completion of the pre-apprenticeship programme and their 6 week placement both Gregor and Reece’s skills, commitment and achievements were recognised during their work placements. 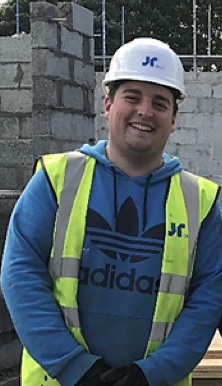 – On the 3rd September our Community benefits co-ordinator, arranged a site meeting with both Gregor and Reece to discuss their future roles within our company. Expressing an interest in future bricklaying and joinery positions within The JR Group. 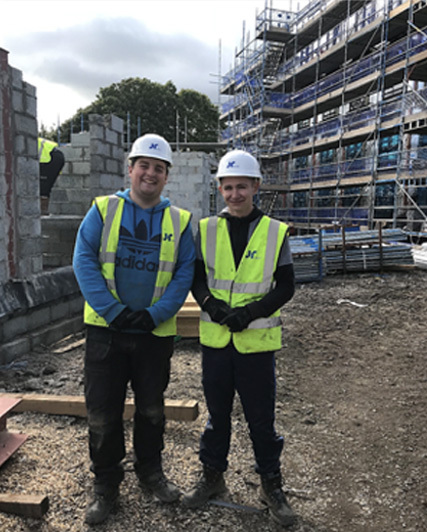 – Week commencing 10th September we organised for both boys to work alongside our bricklayers for a week, giving them first hand experience of the job. 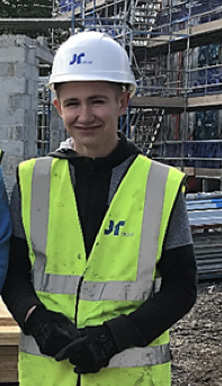 Reece has continued to show a keen interest in becoming a bricklayer and will exploring bricklaying opportunities with us for early next year. Gregor too is keen to explore our apprenticeship joinery positions over the coming months. 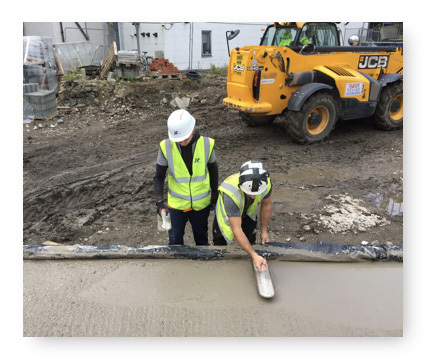 Until their apprenticeships commence both Reece and Gregor will be given the opportunity to experience working on all 3 of our sites with Link Group – Hillhouse Road, Olympia Street and Law Place. The rotation around sites will allow them to gain experience of working in 4 very different sites of varying scale and nature. “I’ve learned so much since starting with the JR Group and have been involved in so many different tasks. I helped form the shuttering and re-bar for the structural topping to block 2. I also helped crane the windows into the blocks which I really enjoyed but the highlight for me was bricklaying and this is what I would like to train in. “Working on site at Olympia Street has been a great experience. After being unemployed for so long I was desperate to get back out to site and get some proper experience. There is so much to do on site so I’m always busy and always learning new things. I was trained through TIGERS as a banksman and have a banksman ticket. I’ve managed to put this training into practice on site, banking the forklift when there are difficult loads. I have also been involved in crane operations where I was the slinger, which is another thing I am now qualified in. This case study is an excellent example of how a commitment to Community Benefits makes a positive impact on the lives of individuals. Their drive to be part of our apprenticeship programme will strengthen their overall skills and allow them to securing full time employment and apprenticeships in their chosen fields. A core opportunity resulting from our dedicated approach to delivering real benefits. We are currently working with TIGERS to place an additional 2 candidates at Olympia Street as well as 2 others at Hillhouse Road. Further to discussions with our sub-contractors and suppliers, many expressed an interest in taking on apprentices. TIGERS can offer the same route and support to our subcontractors and partners this allows placements and opportunities of employment to be delivered direct and all information shared back to JR. We are currently in discussions with our sub-contractors/suppliers with a view of them also taking on new employees through TIGERS as a result of the work which we have placed with them through our contracts with Link Group. TIGERS also have Links with schools in the local authority areas where our sites are. We are planning on working together with TIGERS school visits and also employer talks with trainees on the programme and have a meeting to discuss/organise dates on Monday 5th November.